Savannah, Georgia, doesn’t possess the most romantic origin story. The settlement began as a strategic buffer to protect English claims in the new world against encroachment from Spain and France and as a place to send indigents. In 1732 parliamentarian James Edward Oglethorpe received his Royal Charter for the new colony of Georgia in 1732 and immediately began preparing for the expedition. He landed on a Georgia bluff in February of 1733 and founded the Georgia colony and what later became known as Savannah: a strategic military outpost and refuge for paupers. From these perhaps inauspicious beginnings, Savannah has grown into an important city in the South. Jews have been a part of Savannah's development throughout its storied history. By the time of Oglethorpe’s landing, the Jews were already on the way. Apparently, the Jewish community of London seemed just as eager to dispose themselves of their own dependent citizenry, and in 1732 a committee of prominent Jewish Londoners organized a ship to transport their financially strapped brethren across the Atlantic, out of sight and off the community dole. These first Jewish arrivals in Savannah seemed to have no intentions of casting off their heritage in the New World. They brought with them a Torah scroll and a circumcision box and upon arriving, immediately began organizing Savannah’s first Jewish congregation. In July of 1735 the Jewish residents formally established the congregation Kahal Kadosh Mickva Israel, which was later to be shortened to Mickve Israel. At the time, it was only the third Jewish congregation in America, following those in New York and Newport. Despite the optimistic beginnings, the Jewish community of Savannah suffered from numerous pressures and all but evaporated by the 1740s. The colony-wide prohibition against slavery and the distribution of land in small plots made profitable large-scale plantations impossible. Many member of the Jewish community also questioned the settlement’s ability to defend against a possible Spanish attack. In August of 1740, Oglethorpe led a failed expedition against the Spanish settlement of St. Augustine. Following this military debacle, nearly all of the Jews in Savannah relocated to Charles Town, South Carolina or to other safer and more economically promising northern settlements. The Jewish community gradually trickled back to Savannah following the easing of restrictions, including the legalization of slavery, rum and private land ownership. In the year 1750, a full 17 years after the Jewish community’s founding, only 16 Jews lived in Savannah: the family of Abraham and Abigail Minis, the brothers Daniel and Moses Nunes, and the family of Benjamin and Hannah Sheftall. During these years, the small Jewish community adopted a growing role in the economic life of the settlement. Benjamin Sheftall and his sons Levi and Mordecai became significant landowners, acquiring nearly 4000 acres of farmland as well as properties in town. Abraham Minis died in 1757, but his death didn’t stop his wife Abigail from buying thousands of acres of farmland and town lots. Moses Nunes also acquired substantial holdings. Jews began to take an active role in Savannah civic life. Both of the Nunes brothers were active in the Masonic lodge, and Daniel rose to a high rank. Moses became an important Indian interpreter to the governor, and in 1768 he was appointed Searcher of the Port of Savannah. As the stability and social permissiveness of the settlement improved, more Jews arrived in Savannah and the Jewish population gradually increased. In 1773 Mordecai Sheftall contributed land for a Jewish cemetery and for the eventual erection of a synagogue. In 1774 Mickve Israel was formally revived and the congregation began to meet at Sheftall’s home. During the colonial period, the Jews of Savannah participated in a vast mercantile network reaching across the Atlantic. From Holland, England and other European bases, Jews fanned out to the Caribbean and the settlements of North America, maintaining close ties with other outposts through business ventures and marriages. Mordecai Sheftall and Daniel Nunes took brides from Charleston and New York, respectively, and in 1768 Levi Sheftall married a 14-year-old from the island of Saint Croix. These broad reaching social ties facilitated the efficient trading of goods throughout the new world. When the Revolutionary War broke out, most of Savannah’s Jews rallied to the patriotic cause. The Revolution promised a final break with the old European social hierarchies and a new society predicated upon religious freedom and equality under the law. Once the war was underway, the task of local government in Georgia settlements fell to the Parochial Committees of Safety. In Savannah, Mordecai Sheftall was appointed to head the Committee, and he was joined on the committee by his brothers Levi and Phillip Minis. In late 1778, the British took the city and many of the Savannah’s Jewish residents fled to Charleston or further north to Philadelphia. Mordecai Sheftall, the highest ranking Jew in the Continental Army, and his son Sheftall Sheftall were not so lucky: they were captured while trying to escape the city and were taken aboard a prison ship. The double-named teenager was eventually released, and later conducted daring missions for the revolutionary cause despite his young age. A combined Franco-American force attempted to retake Savannah in the fall of 1779. On October 8, General Benjamin Lincoln used the Jewish cemetery donated by Mordecai Sheftall as a strategic redoubt, declaring that “the second place of rallying … will be at the Jew’s burying ground.” The reserve corps fortified the grounds with cannons, but those buried souls underfoot apparently contributed very little to the war effort. The assault ultimately failed, and the city remained in British hands until the close of the war. Savannah began a process of slow rebuilding after the Revolutionary War, but never achieved the status of a leading port city. Both the city and its Jewish community suffered from a number of setbacks in the ensuing years. The Jewish population remained in constant flux as many new arrivals soon decamped for opportunities elsewhere. In his diary, Levi Sheftall records that around the time of the Revolution and in the ensuing years, Jews were “continually going & coming” through Savannah. Sheftall also noted that many potential Jewish residents soon moved on for Charleston, a booming city that established itself as the preeminent regional port around the turn of the 19th century. By the end of the 1700s, the Jewish population of Savannah numbered as few as a dozen families. In 1786, Mickve Israel was reestablished once more, and congregants met and elected officers in a rented space. The congregation made plans to build a permanent synagogue, but a scandal erupted over inferior materials purchased for the construction, and the plans were scuttled by 1791. At the time, the Jews of Savannah could not imagine that they were lucky to have decided against building a synagogue, but the serendipity of their inaction soon became apparent. In 1796 a fire ravaged the city, decimating many of its structures and Savannah’s modest economic progress. Members of the Jewish community must have felt some relief that their synagogue resided safely in their dreams for the future, rather than amidst the charred structures that blackened the city. Congregation Mickve Israel finally dedicated their synagogue in 1820. The same year Savannah’s Jewish population reached nearly 100 persons, a significant increase from the paltry numbers of a few decades previous. The Mickve Israel dedication ceremony indicated the extent to which the Jews of Savannah identified their faith as one similar to their Christian neighbors. The ceremony included an organ played by the musical director of the city’s Independent Presbyterian Church. The organ provided musical accompaniment as the Torah scrolls were brought into the new building. The event marked the first time in American history that an organ was played in a Jewish synagogue, a harbinger of the progressive tendencies that would define the Jewish experience in Savannah for years to come. On December 4, 1829, another cataclysmic fire swept through Savannah, destroying the new synagogue. Despite the loss of the building, the congregation had some good fortune: all the Torahs and ritual objects were rescued and a prescient insurance policy with the nascent “Etna Insurance Company of Hartford” left plenty of money to rebuild. This time around, the congregants opted for less flammable materials, and after some setbacks, a new brick synagogue rose on the corner of Perry Lane and Whitaker Street by 1838. The official dedication ceremony, held three years later in 1841, featured another public procession, but this time no mention of an organ made it into the history books. During the mid 1800s, the Jewish population of Savannah absorbed Jewish settlers from nearby cities as well as German immigrants, who soon constituted a majority of the city’s Jewish population. An 1850s listing of pew assignments in Mickve Israel bears the names of 45 male members, as many as half of which belonged to first-generation German arrivals. The Jewish community doubled in size during the 1850s, reaching approximately 345 by 1860. This growth strained the modest congregation, raising new controversies of whether to follow the Sephardic or Ashkenazic ritual and the degree of modernization allowed in the service. By 1853 the congregation had grown large enough to support a rabbi, and hired Rabbi Jacob Rosenfeld, an 1842 immigrant from Lissa, Posen. During this period, the congregation officially defined itself as Orthodox and Sephardic, although rifts remained. In 1861 Rabbi Rosenfeld left to organize a separate Ashkenazic congregation, named B’nai Brith Jacob. From the earliest years of settlement, Savannah’s Jewish residents participated comfortably in the city’s civic life, leadership, and local customs. This tradition apparently continued with the influx of nineteenth century German arrivals. Unfortunately for Savannah’s Jews, some felt compelled to follow one local activity for which the People of the Book are not renowned for great prowess: dueling. In the 1800s, at least three Savannah Jews participated in this deadly ritual of honor and gallantry. In 1832, Dr. Phillip Minis found himself maligned at a local bar by a lawyer and state legislator, James Stark. According to those present, the young and intemperate Stark blasted Dr. Minis as “a damned Jew … who was not worth the powder and lead to kill him.” When Stark later refused Minis’ demand for an apology, a duel was arranged. Minis failed to show up at the appointed hour, claiming that his rifle was being repaired. They did meet later in the barroom of Savannah’s City Hotel, where Minis fired and killed Stark. After a lengthy trial and much citywide deliberation, Minis was acquitted by reason of self-defense. Perhaps the violence of the Civil War led to a resurgence of dueling in the Reconstruction Era. In April 1868, Samuel Yates Levy, editor in chief of the Savannah Daily Advertiser criticized in print the political views of a certain Dr. James Waring. Waring, apparently thin-skinned, demanded a duel. Levy obliged, but luckily friends were able to defuse the situation. Things did not turn out so well for Ludlow Cohen, whose enmity with planter Richardson Aiken apparently began with a disputed yachting race. They met to defend their honor on August 19 1870 at a plantation north of Savannah. Both apparently were poor shots, but on the fifth exchange Aiken felled the unfortunate Cohen, thus concluding with tragedy the age of Jewish dueling in Savannah. ​By the mid-1800s, Savannah had grown into a leading port and railway terminal. A substantial majority of the Jewish residents worked as merchants, providing the goods necessary to maintain the city’s growth. A survey of occupational distributions among Savannah’s Jews in 1860 found that out of a total of 130 employed Jewish residents, more than 90 worked as either merchants or salesmen. Although some Jews in Savannah did peddle goods to the surrounding countryside, a greater number worked in town as clerks and ultimately proprietors of the numerous Jewish-owned stores, selling dry goods, drugs, furniture and all the city’s sundry material needs. Simon Guckenheimer left Bavaria for New York City in 1851. After saving up some funds peddling around New York, he moved to Savannah and expanded his operation. He established his first store in 1855 in Charlton County, Georgia and relocated to Savannah in 1860 where he built a successful wholesale tobacco house and also marketed groceries and flour. Guckenheimer’s story is just one from among the scores of Jewish Savannah merchants and clerks who constituted a large proportion of the city’s retail economy. Like the colonial traders from Savannah’s early years of settlement, these merchants relied upon an extended trade network facilitated through religious and familial ties. Savannah businessmen conducted regular business with Jewish wholesalers in New York City, Philadelphia and Baltimore. The Civil War curtailed Savannah’s general prosperity, and halted the Jewish community’s growth. As a major Southern port, Savannah, attracted immediate attention from the Union armies. Georgia seceded from the Union in January of 1861, and by April of the following year Union troops had captured Savannah’s Fort Pulaski and imposed a blockade on the city. The citizens suffered under the blockade until Savannah served as the unfortunate terminus of Sherman’s tear through Georgia. On December 22, 1864, Sherman sent his famous telegram to Abraham Lincoln offering "as a Christmas gift, the City of Savannah with 150 heavy guns and plenty of ammunition; and also about 25,000 bales of cotton." Photo courtesy of Savannah Jewish Archives . After the devastation of war, the Reconstruction era provided the opportunity to reorganize and reorient life in Savannah. Bolstered by German immigrants, the Jewish population grew rapidly and surpassed 600 in the decades following the Civil War. Within the Jewish community, new civic organizations took hold and longtime establishments sought a new direction. Beginning in the late 1860s, Congregation Mickve Israel gradually liberalized rituals and edged closer to an embrace of the Reform movement. In February of 1868, under the leadership of Raphael de Castro Lewin, the congregation instituted mixed-gender seating, omitted the second day of festivals, shortened some services and established a mixed choir. Change came slowly, but by 1880 newlyweds could forgo the traditional wedding canopy. In 1894, men were allowed to show up without a hat on their heads; ten years later, Mickve Israel formally joined the Union of American Hebrew Congregations.Much of congregation B’nai Brith Jacob’s early documents have been lost to history. The group apparently evolved from a branch of the Independent Order of B’nai Brith that had functioned in Savannah for some time. Congregants raised funds and in 1867 began building a synagogue on the corner of Montgomery and State Streets. The mayor of Savannah, aldermen and local officials all participated in the cornerstone consecration procession. The congregation at this time consisted of an estimated 30 members who worshiped in accordance with the Orthodox Polish ritual. Not to be outdone, the congregants at Mickve Israel soon planned for a new sanctuary of their own. The striking neo-Gothic building which rose on the southeast corner of Monterey Square was formally dedicated on April 11, 1878. In addition to elaborate “cathedral” stained glass windows and marble tablets, the new structure was provisioned with 150 spittoons. New social organizations also took root in the post war years. In 1865, Augustus Reich hosted the first meeting of the Harmonie Club, Savannah’s first locally founded Jewish social club. In his opening speech, member Lawrence Lippman alluded to the traumas of the recently concluded war by stating that the new club will provide “pleasant companionship … to hand down to posterity a great harmonie without stain or blemish.” Other organizations soon followed, and by 1876 Savannah had a number of active organizations including Kesher Shel Barzel, B’nai B’rith, and the Hebrew Benevolent Society. As railroad lines and shipping routes multiplied in the decades following the Civil War, the Jewish merchants of Savannah found themselves well situated at the nexus of an extensive commercial network. Consequently, many of these retailers switched to wholesaling and manufacturing, some rising to great regional prominence. The dry goods wholesaling firm of Eckman & Vetsburg shipped goods to Georgia, Florida, South Carolina and Alabama. Such firms often established branch offices to increase their reach. 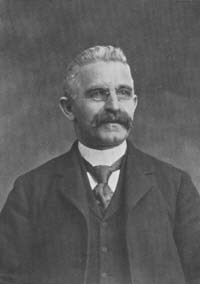 In the years following the Civil War, Samuel H. Eckman moved to New York City to facilitate purchases for the firm. Others Jews in Savannah branched into manufacturing. The Myers Brothers – Herman, Frederick and Sigmund – distilled bourbon and rye whiskey at a site in Kentucky. They also owned a tobacco works in Richmond, Virginia and cigar factories in Jacksonville, Florida and New York City. B.B. Jacob's old synagogue, now a student center for a local college. The wave of immigrants from Eastern Europe around the turn of the century swelled the ranks of Savannah’s Jewish community. Between 1890 and 1900 alone the overall population of Savannah ballooned by 25% to more than 54,000 inhabitants. By the year 1900, the city was home to more than 300 recent immigrants from Poland and Russia, the vast majority of which were Jewish. The Jewish population increased rapidly, rising to 1,500 in 1905, 3,000 in 1912 and surpassing 5,000 in 1918. The first Russian Jews arrived in Savannah in 1883 and were largely greeted with equanimity by the city’s Jewish community. Although many joined the existing congregations, some of these immigrants established a separate Orthodox group that met on Broughton Street, led by a man named Joseph Mirsky. On one occasion, another congregant, Mr. Levitan, interrupted services to accuse Mirsky of lighting fires on the Sabbath. Mirsky responded in decidedly unSolomonic fashion by slapping Levitan. Mirsky was promptly arrested, but the outcome of the ensuing trial is unknown. During this time of increased immigration, other Jewish groups arose in Savannah. In 1903 Congregation Agudath Achim formed as a small congregation following Orthodox ritual. 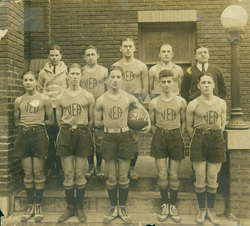 Basketball team affiliated with JEA, c. 1921. Following the outbreak of World War I, the Jews of Savannah rallied around the war effort and their congregations. Funds raised by the women of Mickve Israel to re-carpet the sanctuary were instead invested in Liberty Bonds. Young men of the congregation enlisted in the military, and in 1917 the congregation board determined to maintain membership “without charge of dues any member of the congregation serving in the Army or Navy of the United States.” Even Mickve Israel’s Rabbi George Solomon answered the call of duty, leaving the congregation in 1918 to serve for five months as a military chaplain. The period immediately preceding and following World War I brought new Jewish institutions to Savannah. In 1911, Rabbi Solomon and others organized the Federated Hebrew Charities, a citywide umbrella organization which soon evolved into the Savannah Jewish Council. 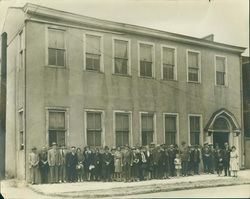 Two years later, many of the same people involved in FHC established the Jewish Educational Alliance, a “Jewish community club house” intended to provide social and educational opportunities for Savannah’s Jews. As in the case of Educational Alliances that appeared in other major American cities during this period, the Savannah JEA helped to acculturate recently arrived Eastern European immigrants. Members of Agudath Achim stand outside their 1919 synagogue. In 1919, congregation Agudath Achim (still spelled “Agoodath Ahhim” at this point) built a synagogue on the corner of Montgomery and York Street. The congregation ostensibly grew steadily, hiring a full time cantor in 1927 and establishing a religious school in 1933. Savannah congregations grew steadily after the war, but the enthusiasm of the roaring twenties ended a bit early for Mickve Israel when their synagogue suffered another fire. The tragedy began with a celebration. In 1926 the congregation celebrated the fiftieth anniversary of Mickve Israel’s cornerstone laying ceremony. After the festivities, members decided to restore the aging structure. Work was progressing briskly until the day of April 19, 1927, when a workman accidentally left a blowtorch on the roof. Not surprisingly, a fire began and quickly spread. Upon hearing of a fire at a Savannah synagogue, the firemen promptly rushed to B'nai B'rith Jacob instead. After arriving at a building that was clearly not on fire, they rushed to Mickve Israel. By the time they arrived, a cadre of heroic congregants had already saved the historic Torahs, as well as other priceless ornaments and documents. B’nai Brith Jacob, the Educational Alliance, and numerous churches all offered their spaces to Mickve Israel during the eight months of repairs and restoration. Perhaps the Great Depression was not an ideal time to establish a new synagogue among Savannah’s already crowded congregational landscape, but the founders of Yeshurun Congregation didn’t seem too concerned. The group formed in 1931 and affiliated with the Conservative United Synagogue of America. The formation caused much dissent within the Savannah Jewish community, and the resulting discord led to the establishment of the Synagogue Council of Savannah. The experiment was short-lived; Yeshurun was suffering from financial shortfalls and disbanded in 1934. Although Yeshurun did not survive, the episode did highlight the Jewish community’s need for a Conservative congregation. Agudath Achim soon filled this role, formally aligning with the Conservative movement in 1945. 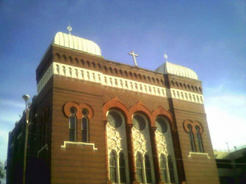 The congregation had recently moved into a large new synagogue on Drayton Street. Upon its completion in 1940, congregants placed a copper time capsule in the cornerstone, containing, among other effects, a letter from Franklin Roosevelt congratulating the congregation. After dipping in the 1930s, Savannah’s Jewish population stabilized in the 1940s at approximately 3,000 individuals, roughly the same number that can be found in Savannah today. Savannah never had the extensive manufacturing base found in other Southern cities, and as such did not suffer the same degree of economic and demographic decline. As a result, in recent decades, Savannah has not experienced a dramatic decrease in its Jewish population, and all the major Savannah congregations have maintained a vital presence in the city. By the 1960s, B’nai B’rith Jacob had long outgrown their aging structure, and the congregation dedicated a new synagogue on Abercorn Street. In 1971, Congregation Agudath Achim also built a new synagogue on Lee Boulevard, with a new cornerstone to house the copper time capsule. A large number of Jewish-owned stores continued to operate well into the post-war period. Lester Harris ran his clothing business,The Hub, on Broughton Street until the 1940s, when he passed it to his son Stanley. The store remained a neighborhood fixture until 1980. Down the street, Harry Reiner’s Style Shop offered women’s clothing before moving to the DeRenne Shopping Center. It also closed in 1980. One of Savannah’s largest shopping establishments, Adler’s Department Store, catered to generations of shoppers on the corner of Broughton and Bull Streets. Opened by Leopold Adler in 1878, the store remained in the family through most of the20th century and occupied two shopping centers before finally closing in 1985. B.H. Levy Brothers and Co. grew into Levy's Department Store, the largest department store in Savannah. The store was sold to a Tampa-based chain in 1986. In recent years, Savannah voters elected a second Jewish mayor. Susan Weiner was born in Albany, New York and moved to Savannah in the 1980s. She apparently acclimated to her new surroundings quickly, winning the Republican nomination for the mayoral race without any opposition in 1991. She defeated a five-term Democratic incumbent to secure Savannah’s top spot. She served one term before losing the 1995 election to Democrat Floyd Adams Junior. The stunning synagogues built by the early Savannah congregations remain vital elements in the city landscape. Mickve Israel still occupies their original 1878 Gothic style synagogue, a building that has been listed on the National Register of Historic Places since 1980. After moving in the 1960s, Congregation B’nai B’rith Jacob ensured that their landmark Moorish revival structure on Montgomery Street would continue to imbue Savannah with a flair of fin de siecle Orientalism. 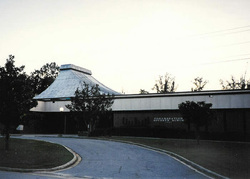 The building housed Saint Andrew’s Independent Episcopal Church from 1970 through 2002, and now inspires new generations of designers and architects as the student center of the Savannah College of Art and Design. 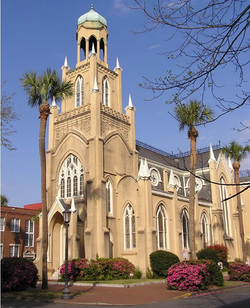 All three of Savannah’s congregations still operate today. B’nai B’rith Jacob is the oldest continuously Orthodox synagogue in the South, and Mickve Israel is the third oldest congregation in the country. All three congregations are a living testament to Savannah’s rich legacy and promising future.